Retaining walls have many applications. 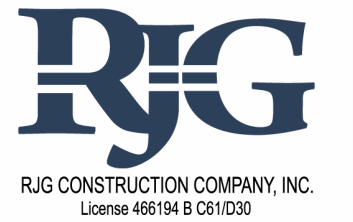 Whether it be retaining a hillside swimming pool, or the foundation of your home, RJG crews have the experience, equipment, and knowledge to construct or repair any type of wall system. Retaining walls may be constructed on conventional spread footings, concrete caissons, or Friction pile foundation systems. No matter what type your engineer specifies, our team is capable of completing the project. Grade Beam reinforcing steel being placed into a retaining wall. 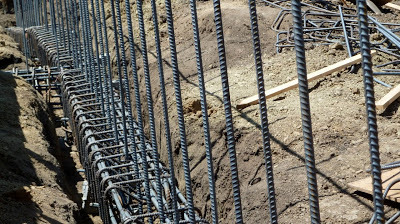 The Grade beam is a structural member which supports the retaining wall on the concrete piles in lieu of a conventional foundation which is supported by the underlying soil upon which it sits. 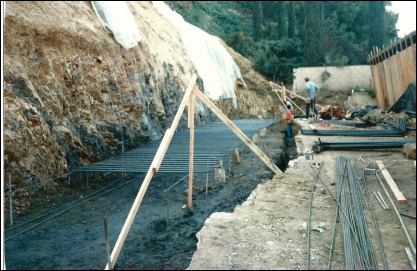 In areas of deep fills, Caisson grade beam systems are often used to avoid mas excavation to competent bearing soil while additionally, minimizing any shoring requirements. 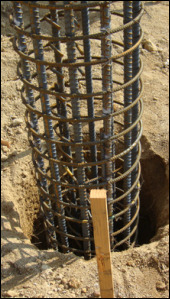 Conventional spread footing construction to support 26ft tall retaining wall. Caisson or Friction pile cage being installed into drilled shaft.